With ardent mastery, Laura MacKenzie commands a vast repertoire of wonderful traditional music. 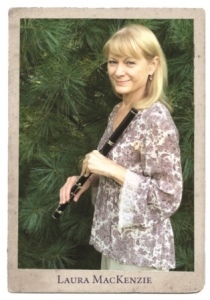 Laura performs a wealth of tunes and songs from Scotland, Ireland, Central France, Galicia, and Cape Breton on a dazzling array of wind-powered instruments, including flutes, whistles, concertina, many bagpipes and voice. With remarkable versatility, her performance is supported by the grace, warmth and humor, the craft, knowledge and lore gleaned over a lifetime of music-making. Laura will be accompanied by Minnesota Music Hall of Fame member, Gary Rue, on guitar.